POP FROM ALL ANGLES: Who is Ean Eraser? While a novel idea, there's something quite charming about a band purporting themselves as an anonymous power-pop band from (of all places) the Ukraine, especially in an age of label affiliations, blog celebrity, hype machines and pre-orders. Everyone wants you to see, to buy, to tongue their wares, their brand, their shtick. So, Ean Eraser might be throwing up their own shtick by giving the listening public the least possible amount of detail in regards to their debut 7". It could be just as well that these guys are simply an unknown '70s group, trying round two with a limited release of something that was never released in the first place? I'll take either. 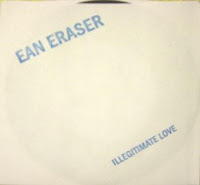 Ean Eraser's "Illegitimate Love" b/w "It Does Not Matter to Me" comes as bare as a record can be -- housed in a white paper sleeve with only the band name and the title of the a-side stamped upon it. The inner-circle concludes the band to be label-less (not even their own imaginary label) and composed of a guy (M. Ford) and a guy (M. Griffin) who share songwriting duties. "Illegitimate Love" is nothing revolutionary, tied faithfully to the power-pop bloodline (mostly a turn-off if tuneless), but manages to be an infectious one-hit-wonder-styled nugget. Unfettered riffs chopping out garage-toned similarities to the Wipers (sans extremity) and the earliest of Prisonshake (sans Cleveland), sung modestly, somewhat prep (? ), in dumb-lung until the chorus rings an anthem. The b-side is not entirely forgettable, but not worth mentioning in the same breath as "Illegitimate Love." It's hard to explain why it's becoming a trend for bands to express in nearly-muted, underwhelming, undercooked, phrasing and still sound great (Nodzzz, Traditional Fools, the Beets, Gun Outfit), but it's becoming enjoyable. Chalk Ean Eraser up with the underdog, barely trying, party-rock circuit. I'm not really in wide-eyed anticipation for a Ean Eraser full-length -- they're just not that type of band -- though I wouldn't balk at them trying. Stick with singles. You can find it exclusively at Florida's Dying. Maybe that's the connection? Is there a Urkraine, FL in Broward County?